Being at storage king for 7 years excellent service All-ways. Fantastic staff. Location is perfect. Highly recommend Storage King Belconnen. Rob, Brad and Rafia have been more than helpful each time I have been there. I have had nothing but trouble with this place from day one. Having to move from interstate and have our stuff in storage is stressful enough with out having to deal with unhelpful and unreliable staff at this store. I have used multiple storage king in the past with no problem. This place is a disgrace to the storage king name. I called on Saturday and the manger still hasn't emailed me a form. Do yourself a favour and find alternative storage rather than using this place. Great service, very prompt in meeting your needs and answering questions, very happy with the facility. Twice I've used Belconnen Storage King and I must say they are extremely friendly and helpful. Prices are great and storage units are clean. I would highly recommend them. When you are in need of boxes and you get really friendly staff with great service and large variety, it's awesome and thank you belconnen storage king for all of this. Friendly, helpful and fun staff. Thanks! We have been long term clients since 2003. The service at Storage King Belconnen is fantastic. They are always willing to help and respond quickly to all enquiries. As a charity it is wonderful to receive ongoing support from Storage King Belconnen. We recently had to increase our storage and Colin went out of his way to sort out for us. We commend Storage King on their service and great community engagement. Great in the short term. Highly recommended if you need space for a month, tops. Onsite staff are great. If you want space for longer please be aware that when they say flexible prices, they mean they will raise them. Then raise them again. And again. I have no objections to yearly price adjustments but i haven't been there a full year yet. In addition if you pay by credit card you will not be provided with any tax invoices - even when you ask. Major headache for record keeping or tax time. Hi Rachel, Thanks for your feedback. We’re saddened to hear that you had a negative experience. Our store manager Colin has reviewed the issues you have raised and would like to discuss your concerns, so if you wish to discuss this further, please call Colin on 02 6251 2772. I've been really impressed with the whole service. Matt, especially, is very professional and goes out of his way to help. 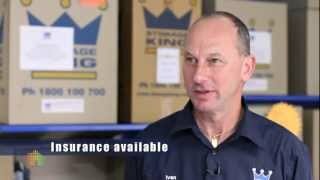 Storage King Belco will always be my first choice whenever I need storage in Canberra. Recently, we accidently left without closing and locking our unit. Chris found this, placed a Storage King lock on it, and phoned us, leaving a message. The service was above and beyond. The Manager Matt is also fantastic. All staff are efficient, polite and extremely helpful. The complex is clean and tidy. This certainly makes moving so much easier. A huge thank you to all the staff at Belconnen Storage King. UnitingCare Kippax is thrilled with the support that Storage King Belconnen provides to our Monster Garage Sales throughout the year. Their generous provision of free storage space allows us to collect donations from individuals, families and businesses earlier and have them stored safely until sale day. Our Garage Sales assist our local community and participants that use our services to access whitegoods, furniture, clothing and other goods at a very low cost. We are only able to do this with community supporters like Storage King, kind donations and volunteer help. Storage King has a wonderful team of dedicated people that are committed to helping our local community. Well done Storage King Belconnen! Used it to store my books and other items. The staff are really friendly (one of the most friendly staff I've ever encountered in all areas), and the price is reasonable. Highly recommend it to anyone who would like to store items. Excellent service, very accessible and a great price. Huge thank you to Matt Hill, the Store Manager, who has done everything possible to make moving out of my house and now interstate, far less stressful than it would've been without his advice and assistance. Matt is always welcoming, patient and considerate. It is with great pleasure that I highly recommend Belconnen as a fabulous storage facility. Matt and the team at Belconnen have provided us with friendly, professional and efficient service. The facilities are clean and well maintained. Many thanks from the Sold On Styling team. Thank you so much to Matt and his team at Storage King Belconnen for outstanding customer service. I have always received friendly, helpful advice and assistance. As I was downsizing as well as moving interstate, Matt's suggestions and patience at all times made the moving and storage process so much easier and stress-free. I would highly recommend this facility for all your storage and packing requirements. I have been using Storage King for 3 years now. The staff are friendly and helpful. The area is clean and professionally displayed. They also sell all of your moving needs, boxes, bubble wrap, tape, and all the other bits and pieces you might need. I like the staff, they are friendly and ready to help if you can't read the instructions. Very accessible for all the family. Been nothing short of trouble free. This is the second time I have had the need to use the same facility. All the staff are very helpful and the use of a free trailer is particularly good. The staff were particularly good when I had to contact them from overseas because my cards were stolen and I had to cancel them and get new ones. Changing accounts can sometimes be a bad experience but it was made easy. Thanks again for your help and assistance. I will no doubt be using you again. If you need storage for home, business, documents or hobbies, look no further! With one call to Storage King Belconnen, you will find your packing, transport and storage solutions. We have a huge range of unit sizes to accommodate your every need- from a small locker to a mini-warehouse. The friendly staff at Storage King Belconnen will help you calculate the unit that best suits your needs. Our state of the art facility is purpose built for self-storage, with slab walls, floor and insulated roofing. Storage King Belconnen is constructed on one level, giving you easy, drive-up access, without climbing stairs or managing elevators. No need to break your back accessing your unit; simply drive to your site, unload using our trolleys, pallet jack or pedestrian forklift and the job is done! Storage King Belconnen proudly services Bruce, Macquarie, Hawker, Florey, Aranda, Scullin, Weetangera, Cook, Lawson, McKellar, Higgins, Latham, Melba, Holt and MacGregor.